PHOTO COURTESY SAMUEL GOLDWYN FILMS Michel Bouquet as the titular Impressionist painter in "Renoir." Whatever the complications and challenges in making any motion picture, films about great artists, especially in the graphic and plastic arts, should really make themselves. Beyond the inherent interest in the life of a particular famous person, the sheer process of creation holds its own fascination, and above all, the images themselves provide a rich possibility for the cinematographer — art, as it must, inspires art. 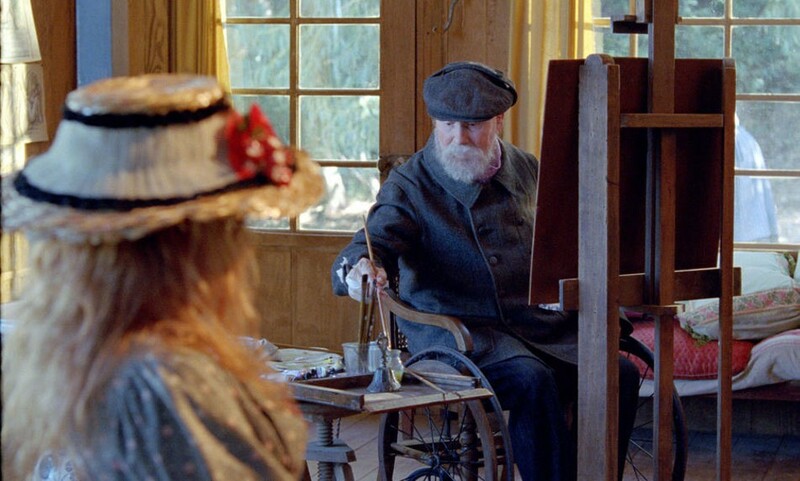 The French movie "Renoir" deals with the two great bearers of that name, Pierre Auguste, the famous Impressionist painter, and his son Jean, one of the most important film directors of the 20th century. It takes place in 1915, during the First World War, in the French Riviera, where the painter, despite crippling arthritis that forces him to have his brushes taped to his hands and demands constant attention from a bevy of servants, continues to practice his art. Two connected events propel the film's action: the arrival of a new young woman, Andrée (Christa Theret), to model for Renoir (Michel Bouquet), and the return of his son Jean (Vincent Rottiers), who has been wounded in combat, on convalescent leave. The lovely Andrée's coloring and personality inspire the aged painter to create some of his best known and most beautiful work; she also inspires Jean in a somewhat different direction. Jean falls in love with her and the two conduct a passionate affair that disrupts the household of women, some of whom have served as the painter's models in the past and apparently as his mistresses as well. Aside from showing the development of the relationship between the two young people, the film also shows some of the friction between Jean and his father. Essentially impervious to the meaning of the war, Auguste seems to think his son wastes himself in the army, while the son cannot convince his father of the importance of his service. After seeing a group of wounded soldiers and discovering a grisly kind of war profiteering, Jean even decides to reenlist. With Andrée, however, Jean finds not only love, but his vocation; her passion for movies and her dream of becoming an actress provide his own inspiration. As the script puts it, she becomes his muse, his star, and his wife: her modeling inspires the aged painter to create some of his most memorable art and the young filmmaker to launch his grand career. Beyond the story in what actually is both a docudrama and a biopic, the movie exploits all the possible sources of visual delight. The camera scans the lovely rural landscape of the South of France, it dwells on the beauty of the naked female body, especially Andrée's luminous flesh, and of course it also shows the painter's work, his sketches and oils, the connection between what he sees and what he creates, his transformation of nature into art. Auguste, who particularly admires Titian, tells Jean that red-haired Andrée is his perfect model, that her skin absorbs the light and that for his painting, only the flesh matters. That perception underlines the vivid and palpable sensuality of the entire film, its devotion to the glowing surfaces of its subjects, whether the fields, ponds, and woods of its location, Renoir's farmhouse, or the beauty of the models and the grace of their gestures and poses. The picture exploits the subject of art in some less obvious ways, showing both the painter and his work and Jean's screening of some reels of early film — movies within the movie in a sense accompany the notion of paintings within the movie and perhaps even prefigure the new art that will dominate the new century. It also shows, in the person of the crippled, irascible old painter, some of the heroism of art, his dedication to his vision in the face of pain and near paralysis. At the same time, it also suggests that the young Renoir's courage, barely recognized within the action, surely makes him a hero as well. "Renoir" uniquely reflects two careers in art, the differences and perhaps the connections between the great painter and the great filmmaker, a really remarkable juxtaposition. As a film about art it ranks with another French work, "Tous les Matins du Monde," both historically true, both beautiful.